We will lay out some of our top choices below, but first, we will lay out a few features you will want to look for when choosing a knife for the outdoors so you can choose your own if our suggestions don’t do it for you. For the sake of safety we always recommend a locking blade. Practicing proper knife safety is still essential, but locks can help prevent some of the smaller accidents from happening. Handle comfort is paramount. The last thing you want is a thin handled knife that digs into your skin during heavier cutting tasks. Generally, thicker is better and try to avoid anything with crazy angles. A good pair of work gloves can also go a long way to making your knife even more comfortable. While tanto blades and recurve edges are attractive, and indeed effective for their intended uses, they tend to be less versatile in the outdoors. A drop point is preferred for its versatility for all manner of tasks, but many clip points are just fine as well. A blade length between 3 and 4 inches will be the optimal size to get enough work done without being too unwieldy to carry or use. While knives with partially serrated edges can be effective at sawing through rope and fibrous material, most manufacturers put their serrated edge at the heel of the blade which can interfere with whittling and woodworking tasks that you may want to perform. And now, on to our picks. Be sure to let us know what you think of our choices in the comments section. 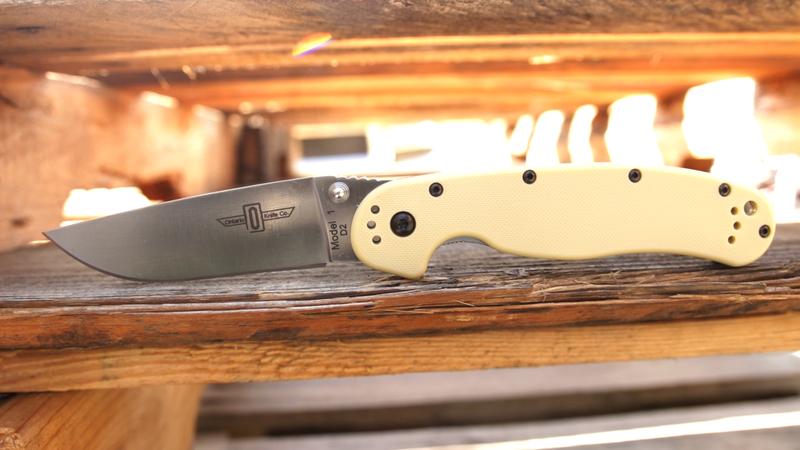 The Buck 110 Folding Hunter is a classic and is the first knife on our list. There is a reason this knife is still being made today more than 50 years after its introduction and that’s because it works. It’s got a really nice clip point blade with an acute tip and a precise hollow grind. 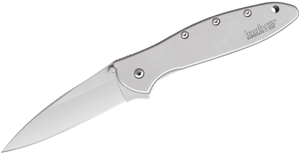 Buck’s famous 420HC steel performs quite well and keeps things affordable. A lock back at the end keeps things secure. One of the great things about the classic iteration of this knife is that it provides a very nicely sized handle. It is thick enough that it allows you to get a really nice grip on the knife without being so thin that it digs in when you put it to harder tasks. There’s no pocket clip on this knife and while a lot of people don’t like to EDC this knife for this reason, it does come with a nice leather pouch for your belt. 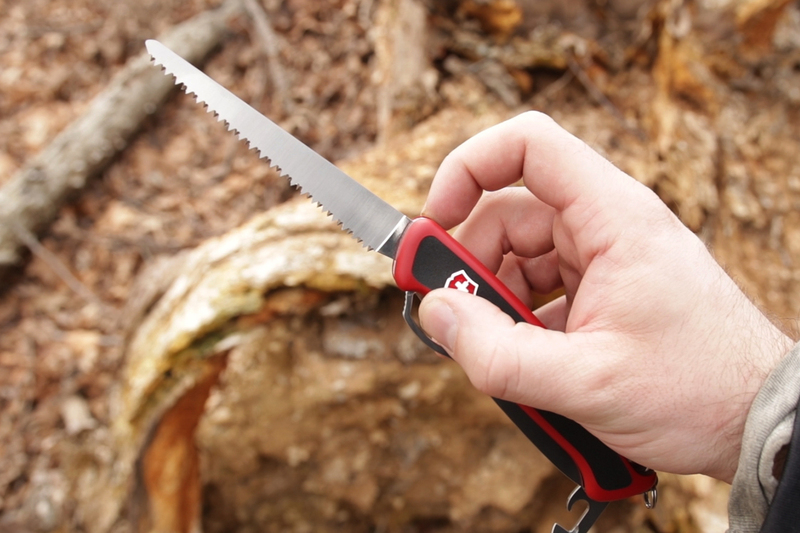 Additionally, the classic look of this knife is going to look right at home at any campsite. 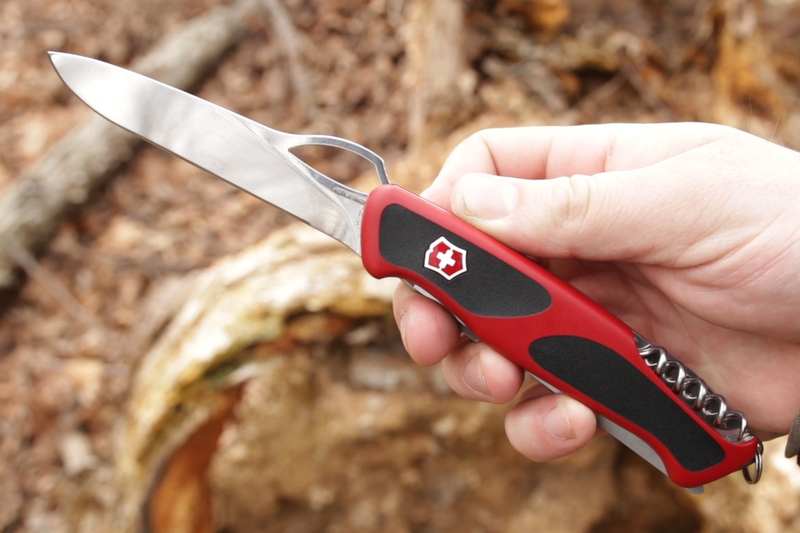 The Victorinox Hunter Pro M is another lockback design and it has a more modern look. It has a one-hand opening stainless steel drop point blade with a very sturdy flat grind. The hole cutout makes it very easy for left-handed or right-handed opening. While this steel may not hold an edge as well as some of the modern super steels, it is very easy to keep a super keen edge on it, even in less than optimal conditions. The real star though are the handles. They’re a synthetic rubber-like material and they’re very accommodating. The lock back is mounted mid spine as opposed to the end like on the 110, and it sits really nicely in that handle. You can get it in a couple other colors as well as a wood handle option. Any one of them is a great choice because this is a knife that will feel great and perform very well. While the Cold Steel Ultimate Hunter looks like an ordinary lockback, this mechanism is actually cold steel’s Tri-Ad lock. In use, it operates the same as an ordinary lockback but there’s some extra stuff going on internally that makes it even stronger. 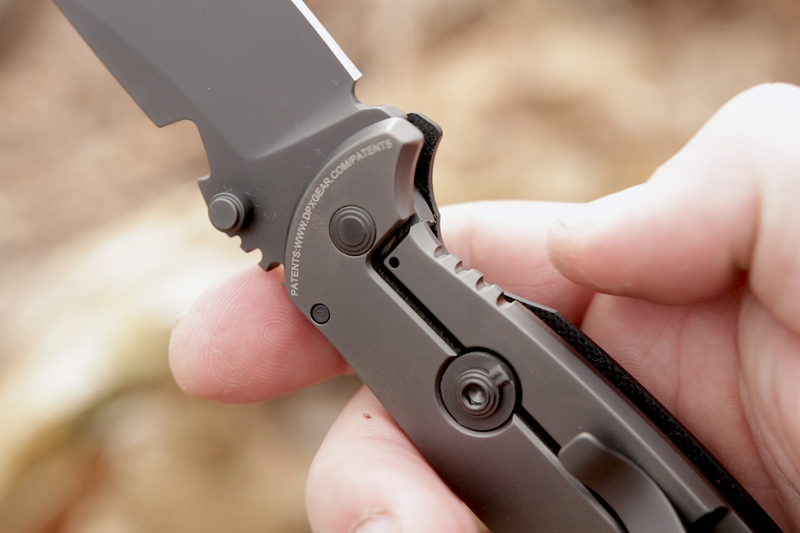 The Tri-Ad lock is what allows the Ultimate Hunter to be a truly hard-use folder. 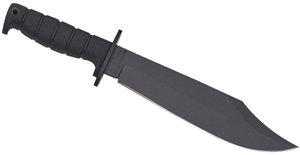 Moving on to the blade we’re starting to get into some more premium steels with S35VN particle steel. The slightly thicker blade with a very high flat grind makes a very nice compromise between outright strength and slicing efficiency. 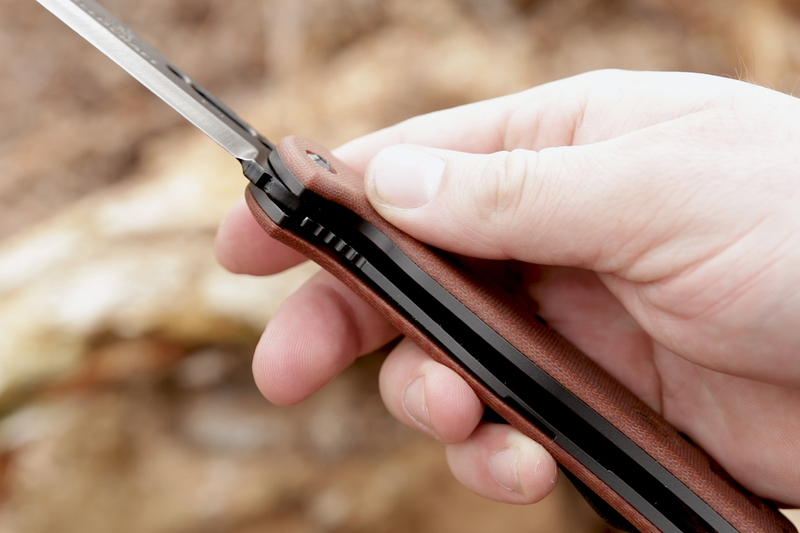 The drop point profile is also going to be very useful in the woods for all manner of tasks and the 3.5-inch blade length is just about perfect, being very easy to handle. 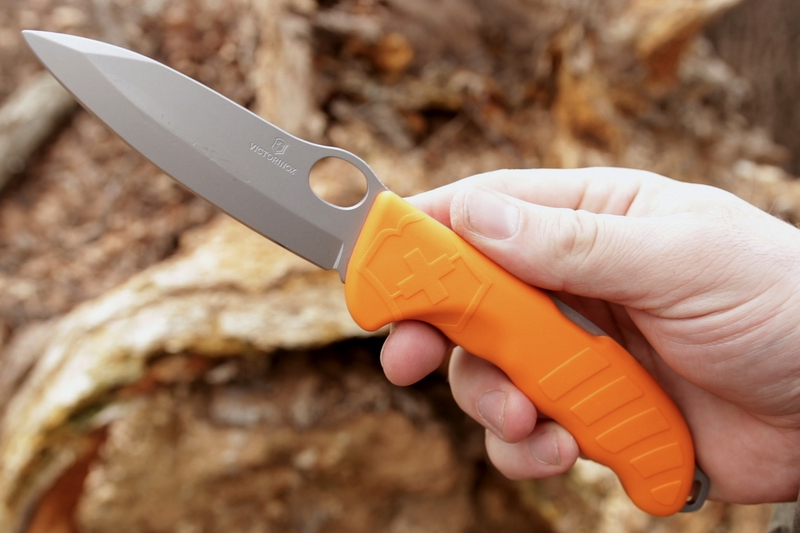 Although it is also available with black G10, the orange handled version is both highly visible and very comfortable. You actually get two pocket clips with this knife one for the left side or the right side but if they are causing a hot spot, they are very easy to remove to make this handle even more accommodating. Sticking with heavy-duty folders, we’ve got a knife that was actually inspired by a fixed blade version. 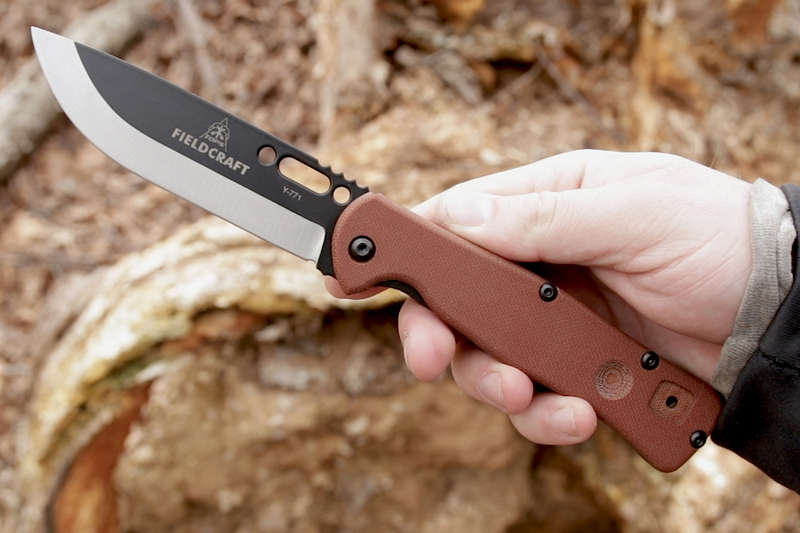 It is the TOPS Fieldcraft folder, and this one is for the bushcrafters out there. The thing that makes this knife perfect for bushcraft is the use of TOPS modified Scandi grind. A Scandi grind is a specialized grind that is especially suited to woodworking. You can think of it as a double planed chisel, and that type of geometry works very well for things like feather sticks, notching, trap triggers or any of those other woodcraft tasks that you might want perform. Just like the fixed version, the nicely sized blade on the folder is made from 1095 carbon steel. In the transition to a folder, they have not given up all that much in terms of strength. You get a nice set of micarta scales that keep things nice and grippy as well as extremely thick liners that house that liner lock. As far as liner locks go this one is extremely beefy, even dwarfing some popular framelocks that we’ve seen. There are multiple carry options with this knife as well. We do have a powder-coated pocket clip for left or right side carry, as well as a high-quality leather sheath for belt carry. You’ll also notice that there’s a divot here on the Micarta scales and that’s on both sides of the knife. 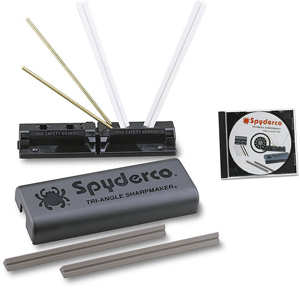 What that allows you to do is use your knife as the bearing block for a bow drill set so if you’re trying to start a friction fire with the bow drill method you don’t have to go looking for that top piece to keep your hands safe. 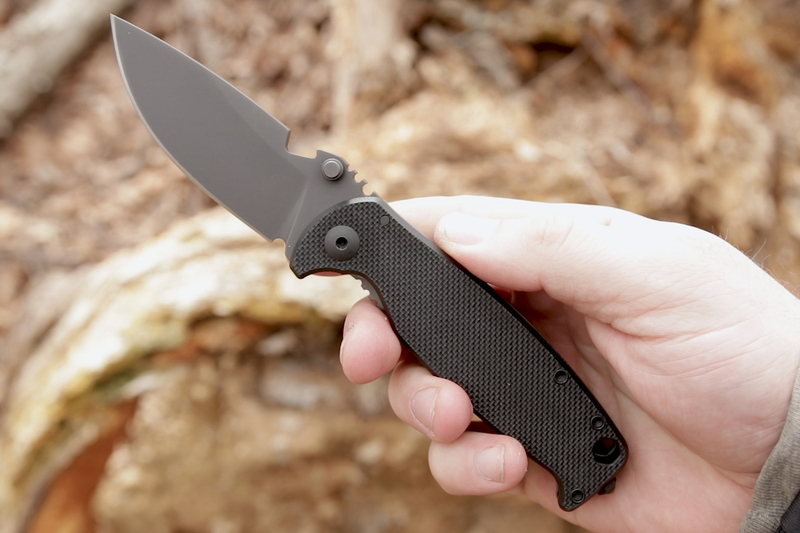 One of our favorite recommendations for a hard use folder that works well not just for camping but also tactical uses is the DPX Hest/F Triple Black. This does have a shorter blade than some of the knives we just looked at but it is incredibly durable thanks to a slightly thicker profile and Niolox steel. The drop-point profile is something that’s going to work very well when you’re out camping but we’ve also got a very interesting cut out on the spine, and that does two things. It allows the HEST to function similar to Emerson’s knives in that you can open the blade as it’s being drawn from your pocket by catching that hook on your hem. It also allows you to pop a bottle of your favorite beverage after you are finished with your work. In addition to that beefy blade, what makes this knife so incredibly durable is the very thick frame lock that the HEST uses. This knife has actually made in Italy by Lionsteel for DPX, and because of that we actually see LionSteel’s patented Rotoblock mechanism make an appearance. It may look like an ordinary overtravel arrestor, but if you screw it down it actually locks the frame lock into place. This gives you a redundant system that keeps that lock from disengaging accidentally. With positive strength on one side and great traction on the other thanks to a G10 front scale, this is a knife that will hold up to very harsh conditions. This was actually a hard one to narrow down to just one model because a ton of Benchmade’s knives could have made this list. The Griptilian series is certainly a great option for camping, as is their beefy Adamas folder. 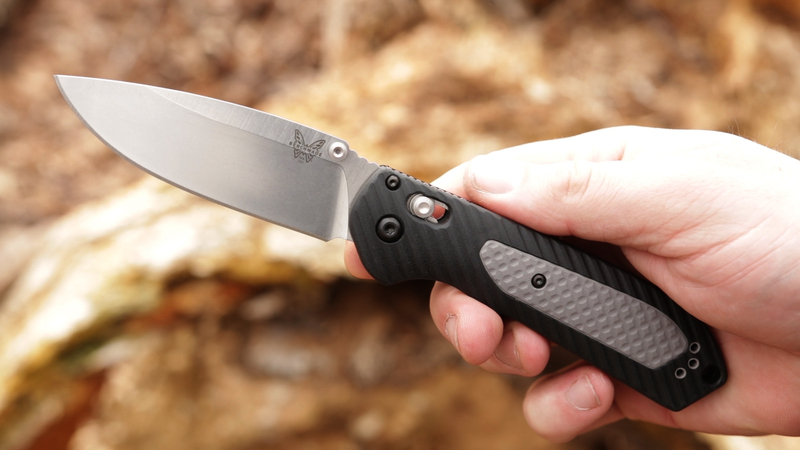 Not to mention, basically anything from their HUNT line would be a great choice as well, but in the end if we had to narrow it down to one, it would be the Benchmade Freek and the reason we went with this knife over all those other great options came down to the blade shape. Again, we get a versatile drop point is going to do everything you need in the outdoors and overall the size and shape is going to transition well to EDC uses when you’re back in your day to day life. It has enough belly at the front that it could even be an excellent hunting folder. It utilizes S30V steel and it is not too thick with a very high flat grind. It has plenty of strength for what you need a folder to do without sacrificing slicing efficiency. The handle sports a two-tone design with a hard Grivory core with a tacky Versaflex over mold, making it easier to hold securely when you don’t want to lose it. We’ve also got Benchmade’s fantastic Axis lock. What we love about this lock is it’s very intuitive and it’s very easy for left or right-handed users to operate thanks to the mechanism that goes all the way through the handle. The extra advantage of this lock is that it allows you to open and close the blade while keeping our fingers free of the closing path. There are a ton of great Swiss Army knives out there and a lot of them have made great companions for campers over the years. Whether you like the classic Farmer the one hand opening Trekker or even my personal favorite, the Outrider, there aren’t a lot of bad choices out there, but if we had to narrow it down to one, it would be the Victorinox RangerGrip 79. One of the things that helps this knife stand apart from other Swiss Army Knives are the rubberized inserts which are going to help keep your grip on the knife. 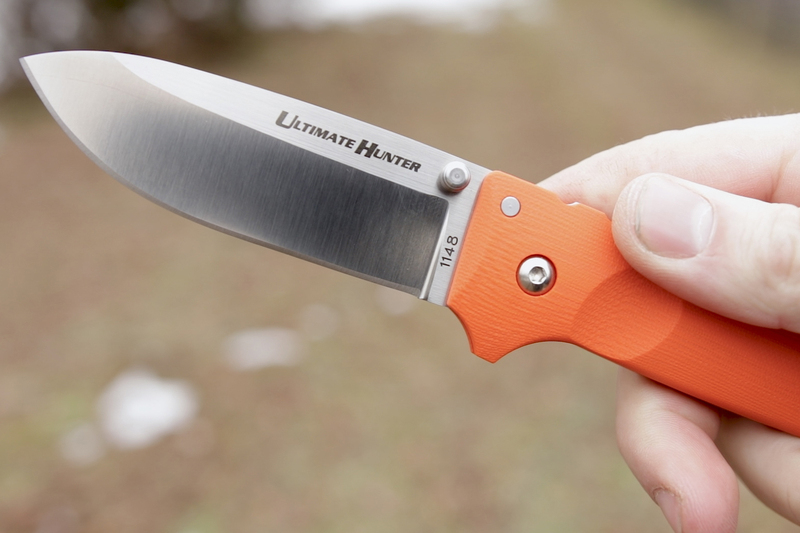 It also has a nice one-hand opening blade that is secured by a liner lock, but unlike most liner locks, it is actually disengaged by pressing the emblem which pushes the liner lock out of the way. While this knife won’t stand up to quite as much hard use as some of these previous picks, the narrower blade profile will actually make it a little more agile in certain scenarios. Another reason for this pick is that it does not have too many layers of tools, meaning it isn’t super thick. It is still very easy to use and not at all cumbersome. The front side also includes a can opener as well as a bottle opener in addition to the screwdriver implements on the tips. Additionally, Victorinox has one of the best foldings pocket saws in the business and we get a nicely sized one with this knife. Furthermore, the back side has a couple of other great tools that are going to be phenomenal for campers like a nice awl and a corkscrew, which does more than just open bottles. The tip is actually very good at untying knots that are stuck too fast for your fingers to get free. 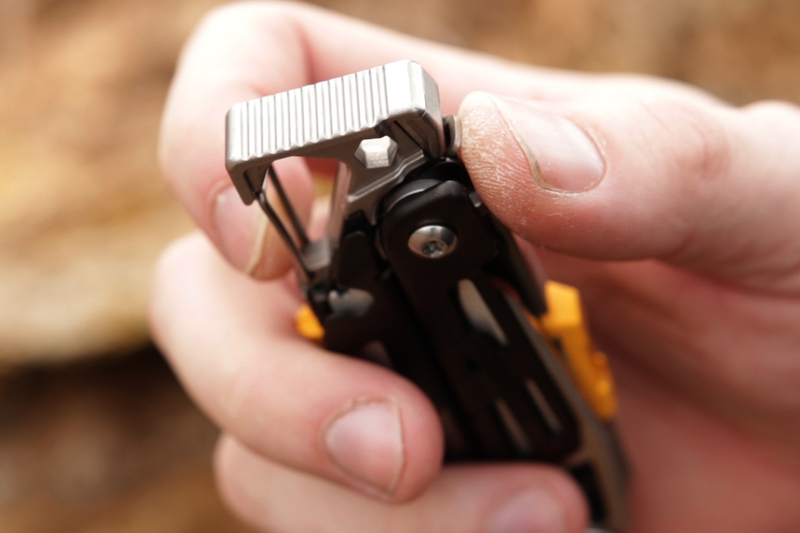 In our opinion, nothing beats a good Swiss Army knife as a backup to your larger knives, and the RangerGrip 79 is perfect for your next adventure. A great budget option for camping folders is the Ontario Rat 1, which has become a classic in outdoor circles because it’s a design that’s proven to be more than just the sum of its parts. It’s one of the most affordable options for a D2 Tool steel folder, historically a very popular steel with outdoorsmen, but if you’d rather have a stainles blade, the RAT 1 is also available with AUS-8. 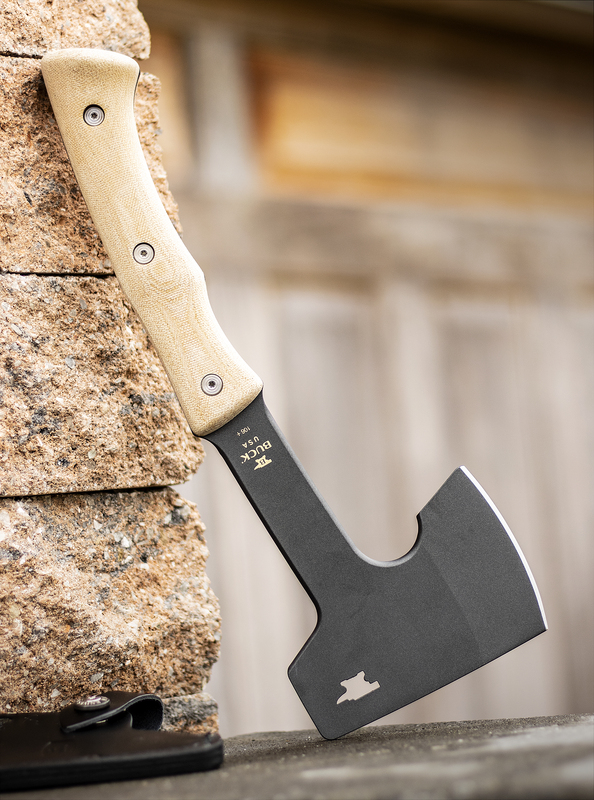 Either way, you get a very nice drop point blade with a full flat grind with excellent slicing efficiency… all important things when you’re outdoors camping. The handles are a little bit thinner than some of these other knives. They’re not too uncomfortable, but this would be a great time time to wear those work gloves. As far as the size goes, it is quite accommodating for largeer hands and, because of the way it’s designed, it provides a nice place for you to choke up on the blade when you want to do some finer tasks. 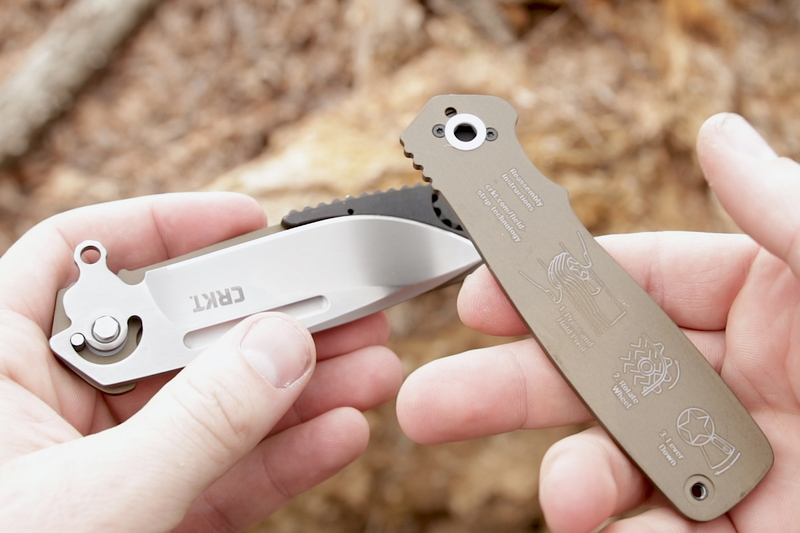 This choice may seem a little bit out of left field at first, but the CRKT Homefront is our next pick. Like a lot of these other knives, it utilizes a nice drop point blade shape, this time with a hollow grind. We see a lot of belly at the front, allowing this to be used for slicing tasks like skinning and food preparation. The handles are also a little bit thinner (remember those gloves) and they can also be had with either aluminum or glass reinforced nylon scales. 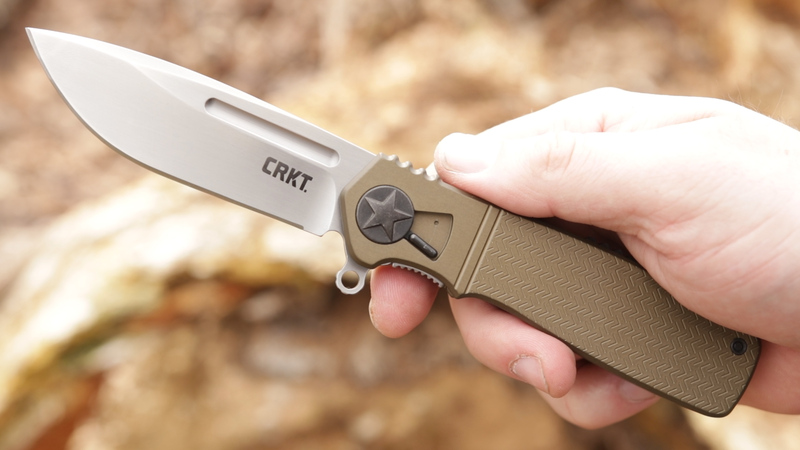 Those elements alone wouldn’t be enough for this knife to make our list, but the feature that does is CRKT’s “Field Strip” mechanism. When you’re out camping it can be tough to keep things clean like you would at home. 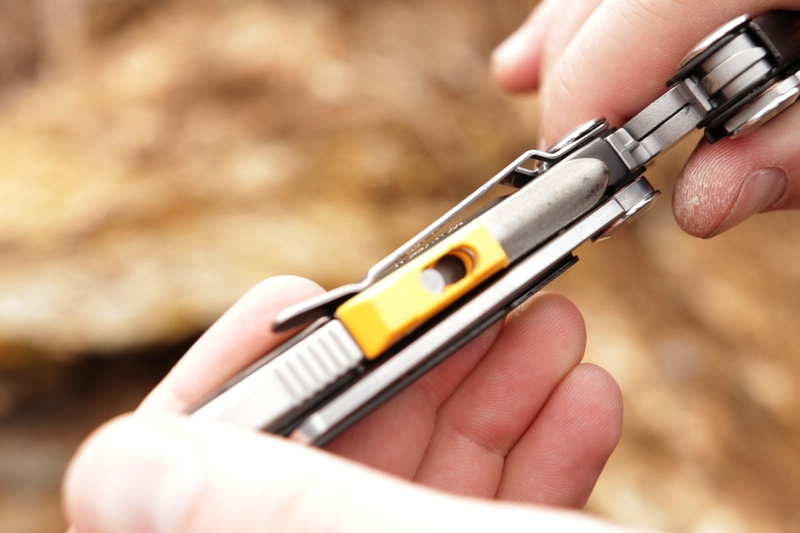 Mud, dirt or grit can really gum up a folding knife’s mechanisms so you want an easy way to keep it clean. The Field Strip mechanism allows you to take this knife apart into three pieces with no tools. This makes it very easy to rinse out when it gets gummed up and put it back together very quickly. 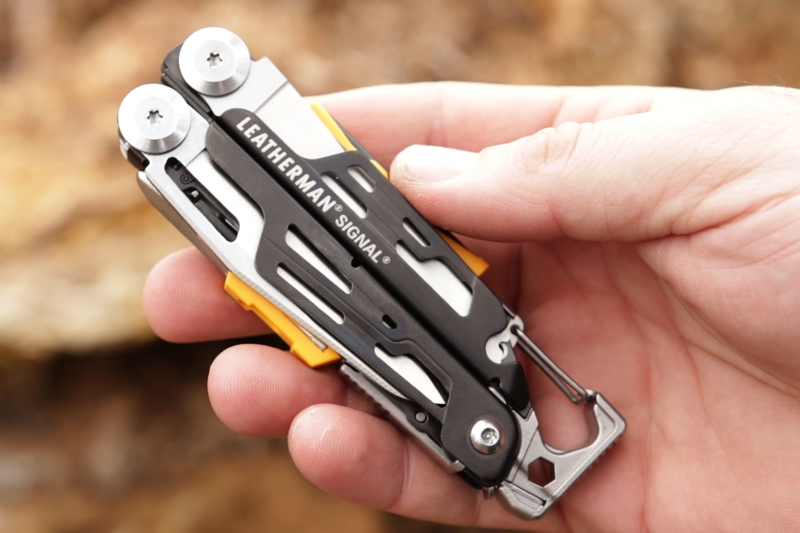 We’re breaking our own rules a little bit with this pick because the Leatherman Signal may have a knife blade, but it isn’t really a pocket knife. Still, it makes a great companion in the outdoors. It does have a nice utility blade which is still useful even though it has a combo edge. When we open the tool we do see a few nice implements on one side, including a nice awl, but the other side features a single piece multi-tool integrated into the frame. This piece can be removed and it contains a small ferrocerium rod on the side that’ll help you start fires for visibility or warmth. It also has an integrated whistle which is going to save your lungs if you do need to do some signaling. While it’s always a good idea to carry these items separately, it’s good to have a nice backup set integrated with the tool. On the back you will find a carabiner that can function as a bottle opener, but you’ll also see a nice flat spot on the end and that can be used for hammering. Whether you’re trying to crack open a nut or drive in a tent stake, it’s a useful addition. 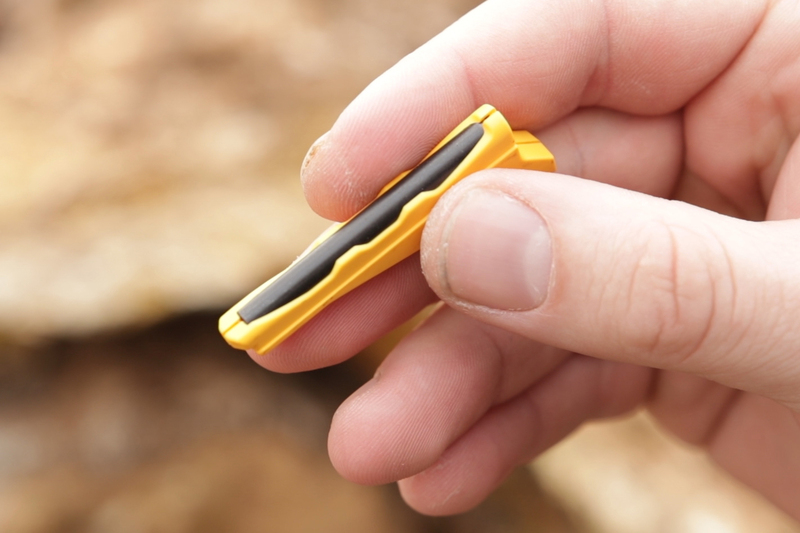 On the other side, we’ve actually got a small removable diamond sharpener which will not only allow you to keep this blade sharp, but also any other blades you might be carrying. 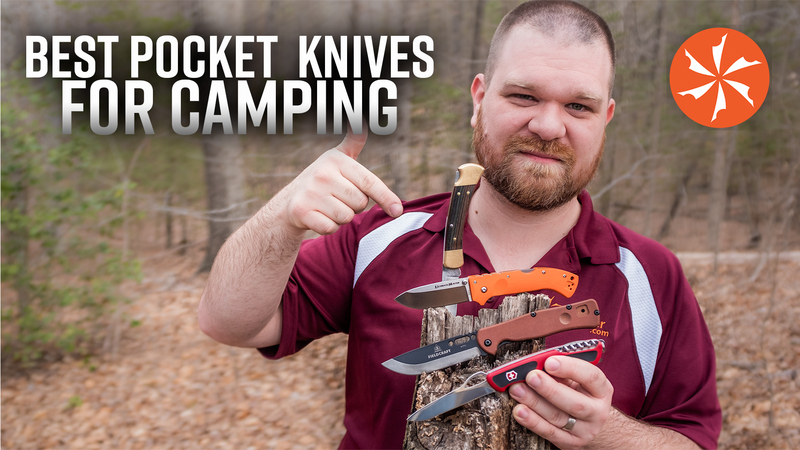 These are just a few of the options you have out there when it comes to a nice camping folder. Even if you don’t pick one of these we hope our advice will help you to choose one that’s right for you. In the meantime, make sure to let us know what you think of our choices in the comments below, and if you like something different, tell us which knife you would take on your next adventure.